November 23, 2016 – When astronauts in the Orion spacecraft travel beyond the moon to explore deep space destinations, they’ll need a robust diet to keep them healthy and sharp. While crew members aboard the International Space Station can choose from approximately 200 items for their meals and have the space to stow an array of options, feeding the crew on deep space missions presents several unique challenges that NASA scientists are working to tackle. To help reduce the amount of supplies Orion will carry for its crew, scientists are developing a variety of food bars that astronauts can eat for breakfast during their spaceflight missions. In the United States, it’s common for people to substitute an energy bar or shake for breakfast, or to skip the meal all together. Food scientists determined that developing a single calorically dense breakfast substitution can help meet mass reduction requirements. On the space station, crew members often pull their desired breakfast from a range of options available, and may eat items from multiple thermostabilized or rehydratable packages. Thermostabilized foods are heat processed to destroy harmful microorganisms and enzymes, while rehydratable foods have their water content removed before flight to save weight and then added back in before they are consumed. 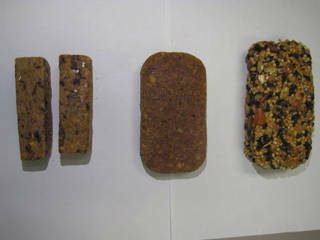 On Orion, the goal is to have a number of food bars to select from in a variety of flavors like orange cranberry or barbeque nut for their first meal of the day, reducing the amount of space and storage the breakfasts require. For lunch and dinner, Orion astronauts will be able to select from similar items space station crew members eat and have a food warmer to help them prepare their meals. But designing a food bar to a specific nutritional balance for astronauts while also increasing caloric density and passing the taste test is no small task. “There’s no commercially-available bar right now that meets our needs, so we’ve had to go design something that not only works for the crew, while trying to achieve a multi-year shelf-life,” said Takiyah Sirmons, a food scientist with the Advanced Food Technology team at NASA’s Johnson Space Center in Houston. Scientists also have to consider how the bars will affect crew morale, since food choice, variety and taste are important aspects of ensuring they consume enough, especially as mission lengths increase. The food bars, which are being developing in coordination with NASA’s Human Research Program have been tested by crew members inside HERA, the agency’s three-story habitat at Johnson Space Center designed to serve as an analog for the isolation and remote conditions in exploration scenarios. The ground-based missions have provided helpful feedback on the flavor, texture and long-term acceptability of the bars that food scientists are using to hone the range of options available. The missions will ultimately help NASA determine the right meal replacement schedule to prevent food fatigue and aversion on long-duration missions. While scientists continue to hone the food bars and expand the variety of options available, NASA also is working to develop regenerative ways to feed the crew on longer missions, including on the journey to Mars. The space station vegetable production system is helping to determine how to regularly grow fresh vegetables in space – astronaut Shane Kimbrough recently started the third such investigation aboard the orbital laboratory. Scientists are also looking at packaging food items to keep them edible and nutritious in conditions where there are temperature fluctuations, such as the surface of Mars. Orion’s first mission with crew will launch as early as 2021 atop the powerful Space Launch System rocket currently in development. The flight will help set the stage for future missions in the proving ground around and beyond the moon, where NASA will refine the technologies and operations needed to send astronauts to Mars.